Perennial. Culms scandent; 100-1000 cm long. Ligule an eciliate membrane. Leaf-blades lanceolate; flaccid. Inflorescence a panicle. Panicle open. Spikelets solitary. Fertile spikelets pedicelled. Pedicels filiform; tip cupuliform. Spikelets comprising 2 basal sterile florets; 1 fertile florets; without rhachilla extension. 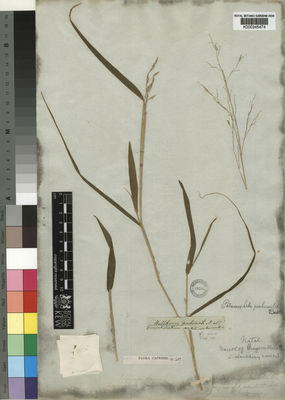 Spikelets elliptic; laterally compressed; 6-9 mm long; falling entire. Basal sterile florets barren; without significant palea. Lemma of lower sterile floret subulate. Fertile lemma elliptic; laterally compressed; chartaceous; keeled; 5 -veined. Lemma surface scabrous. Lemma margins involute. Lemma apex acute. Palea 1 length of lemma; chartaceous; 3 -veined; 1-keeled. Palea keels scabrous.